I know what you’re thinking…because I was thinking it too. 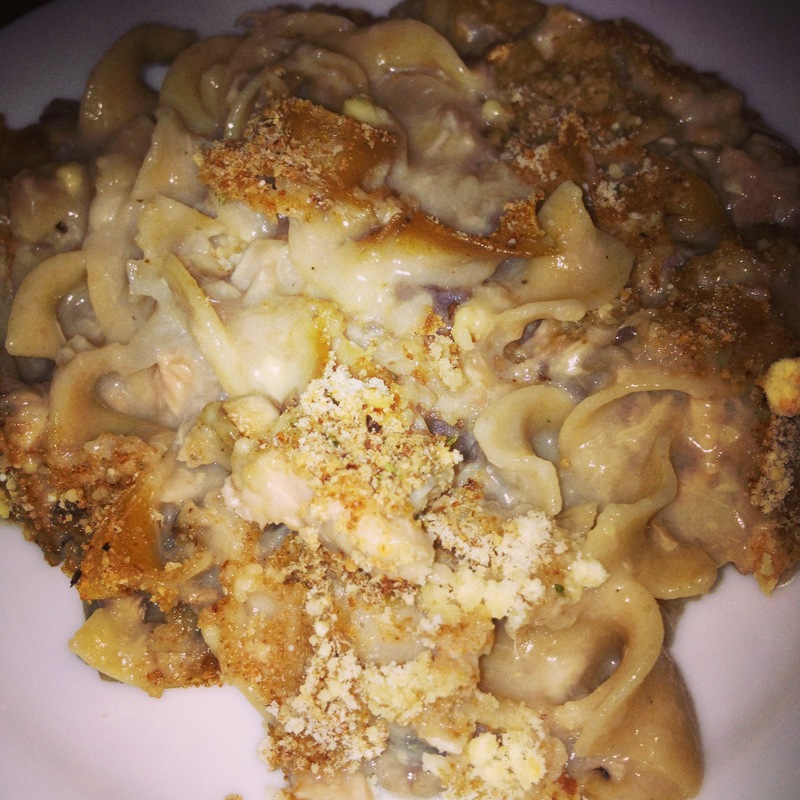 Tuna noodle casserole? Gross. Probably the combined result of stress at work and crummy weather, I’ve been craving something comforting for the past week. Oddly enough, this was it. Directions: Cook noodles in salted water until al dente, or slightly undercooked by 2 minutes. Set aside. Melt the butter in a large deep skillet. Add onions and cook on medium heat until soft, about 5 minutes. Add the flour and a pinch of salt and stir well, cooking an additional 2-3 minutes on medium-low heat. Preheat oven to 375°. Lightly spray 9 x 12 casserole with butter flavored cooking spray. Slowly whisk in the chicken broth until well combined, increasing heat to medium and whisking well for 30 seconds, then add the milk and bring to a boil. When boiling, add sherry, mushrooms and petite peas, adjust salt and pepper to taste and simmer on medium, mixing occasionally until it thickens (about 6-7 minutes). Add drained tuna, stirring another minute. Remove from heat and add 1 cup reduced fat sharp cheddar and mix well until it melts. Add the noodles to the sauce and mix well until evenly coated. Pour into casserole and top with parmesan cheese and breadcrumbs. Spray a little more cooking spray and top and bake for about 20 – 25 minutes. Place under the broiler a few minutes to get the crumbs crisp (careful not to burn).